After years of charming his fans, this modern classical pianist delivers a collection of his most intimate performances. When the phone rings I don't recognize the number. "I'm sorry, who are you looking for again?" It turns out that Robert Raths, the owner and curator of Erased Tapes Records, is in town for a few days. We arrange to meet at WFMU Record Fair, one of the largest vinyl aficionado gatherings in New York. When I get to the venue, I receive a text from Raths informing me that he's going to be late, and so I dive into a crowded warehouse in search of that one record which will become mine at whatever the cost. While rummaging through a crate of eclectic and rare pieces, I bump elbows with a scruffy young man, with a peculiarly familiar scent of rolled tobacco and mysterious spices. "I know this guy," I laugh, and tug at his sleeve. Nils Frahm shows me the records he picked up, as I ask the dealer if The James Brown Show vinyl I'm holding, is indeed $600. I apologize to Frahm for not being able to attend his upcoming performance the next day at Le Poisson Rouge. This would have been my sixth live show, second in the very same venue. The last time I saw Frahm play at LPR, I published a review consisting of empty spaces, ellipsis, and full stops. My nearly void coverage of the performance ended with just one word: "speechless". It's no wonder that after each and every show, I would run up to Frahm and beg for an album of his live recordings, since many of the performed pieces have never been previously released in the past. Well... finally... here it is! Compiled from over thirty live concerts recorded in 2012 and 2013, this extremely self-critical and amazingly very modest composer selects eleven pieces for this special Erased Tapes release. Spaces is essentially a collection of Frahm's favorite and best performances, featuring a variety of room textures, ambiance, recording techniques, and instruments. The recording also captures a unique experience shared between the performer and his audience, no doubt adding a little something to this very special exchange existing in one single rare moment. 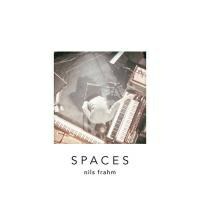 If, by chance, Spaces happens to be the very first record which you pick up by Nils Frahm, I must proclaim to be extremely jealous - you have a beautiful and highly rewarding journey ahead of you, my friend. Among the many favorites, I highly recommend that you travel through Wintermusik (2009), The Bells (2010), Felt (2011), and Screws (2012), all available on the wonderful Erased Tapes Records. And of course, be sure to catch Nils Frahm in person, at least once in your lifetime! A standing ovation for Spaces from me - just like at the end of each and every Frahm concert.